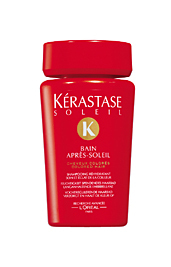 Soleil Bain Apres-Soleil/Repairing Shampoo - Colored Hair Repairing Shampoo for Colored Hair. Gently cleanses and helps repair hair that has been exposed to environmental aggressions. This light, balancing cleanser provides hair with easy detangling and long-lasting softness, while preserving color radiance.